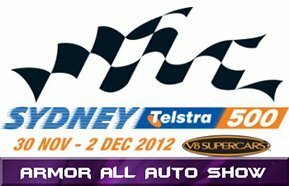 MRTeam is looking forward to exhibiting at the Sydney Telstra 500 Armor All Auto Show from Friday November 30 to Sunday December 2. Raceline Events have been involved with this awesome event for 4 years. In this time, the Armor All Auto Show at the ST500 has grown from a 125 exhibit "add-on" to becoming a very major part of this event - the V8 Supercars Grand Final. For 2012 their target is 700 exhibits & you name it they have the lot on show including a DRAG RACING EXPO with Top Fuel Dragsters & Funny Cars, American & Australian Muscle Cars, Timeless Classics, Rods, Bikes, SuperKarts, Vintage & Veteran, Wild Utes & Customs to late model imports & Drift Cars - the list goes on & on. Exhibitor Displays will be in both the Main Dome & Badgery Pavilion.